The third appliance category that impressed me at GE Monogram last week is their Advantium oven. Since GE Monogram's in Louisville, KY; the home of Churchill Downs and the Kentucky Derby, I'll use a horse racing analogy to rank my top three picks from GE Monogram. The Pro 48 is the win, the Monogram induction cooktop is the place and the Advantium's the show. If there were a catchy word for a fourth place, it would go to some of the innovations they've been adding to their dishwashers. Dishwashers however, are a topic for another day. Today belongs to the Advantium. GE invented and developed the Advantium in 1998 and introduced it in 1999. It's been tweaked a bit in the years since, but this new model year added a fourth dimension that took an already good cooking appliance and made it great. 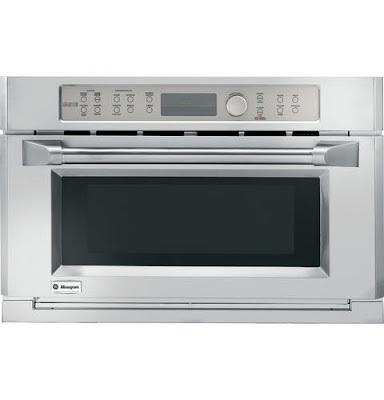 For anyone who doesn't know what an Advantium oven is, here's what one looks like. It looks like a microwave oven from the outside and if you didn't know better, you'd swear it was a microwave when you opened one. It's not a microwave though, although it can be if you ask it to be one. What it is really is a speed cooker that uses halogen light, microwave energy, a convection coil and fan as well as a radiant heat source to cook food. Advantiums are smart in the sense that they come pre-programmed to handle 175 every day foods. You can also add your own settings to the pre-sets or you can also use it in manual mode. When it's not actively defrosting or boiling something, it lays off the microwaves and instead uses its other energy sources to do everything from proofing bread dough to roasting a chicken. What's even cooler is that it performs these tasks at incredible speed while using less energy than a conventional oven. 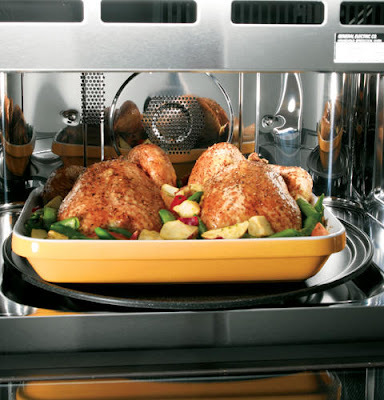 So if you were to set out to roast a four pound chicken, it would take just about two hours in a conventional oven. In an Advantium however, that bird would be roasted golden brown in 25 minutes. As marvelous as the Advantium's speed is, what's truly remarkable is that it smells, looks and most importantly tastes exactly as if it were roasted conventionally. Trust me, I did not go to GE Monogram with the expectation that I would come away from three days of boot camp extolling the virtues of GE. I'm telling you though, that experience shook up my preconceptions and threw my brand loyalties into disarray. 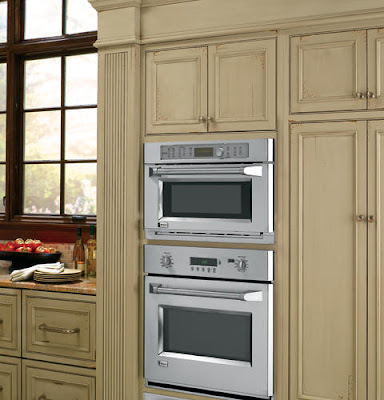 GE Monogram makes some quality appliances that actually work. What can I say? They made a believer out of me and that is no small task. I have always wondered why the Advantium has not been in more kitchens ... I think it just scares people, maybe. It's an awesome product. I wonder the same thing. I think that generally, GE does a lousy job of marketing and advertising their stuff. I think they haven't caught on more because not enough people know about them. Thanks for bringing that up Cheryl, it is in the specs and it's a safety thing. I'm with you, I hate putting a microwave in a base cabinet and my back has to be against the wall in order for me to go along with it. Oh, the gang at Monogram got a kick out of your comment on my love letter to their pro 48. Expect and invitation to Louisville!